While we were in the Orange Walk District visiting our friends Melissa and Coy, we took a day trip to the Maya site of Lamanai. South of Guinea Grass, on the New River Lagoon, Lamanai is about 2km from Indian Church Village. Lamanai is one of the few sites whose original Maya name is known. Lama ‘an ayin is translated to ‘submerged crocodile.’ Numerous representations of the crocodile can be found throughout the site. Lamanai was constructed around 1500BC, and became a prominent site during the Pre-Classic Period. It was occupied until the seventeenth century. At the height of the city’s power with a population exceeding 35,000, Lamanai's trading influence extended over the borders of present-day Guatemala, Honduras, Mexico, and Belize. The first detailed description of Lamanai was recorded in 1917 by Thomas Gann, a medical doctor and amateur archaeologist known for making many discoveries of Maya sites in Belize, including Lubaantun in the Toledo District. Archaeological excavations began in 1974 and were lead by David Pendergast of the Royal Ontario Museum. Current projects at the site have involved teams from Indian Church and the surrounding villages and are mostly directed at artifact analysis. We began our journey through the jungle by boat in Orange Walk Town. Our tour guide, Mr. Wilfrido Novelo of Jungle River Tours, was very knowledgeable. Throughout our trip on the New River, Mr. Wilfrido stopped to point out native and exotic animals, plants, and birds. We spotted bats, iguanas, turtles, great blue herons, and so much more. Mr. Wilfrido also shared local history and points of interest. We stopped along the banks of the Belize Sugar Industries, where we saw barges bound for port being loaded with sugar. We also stopped along the banks of a local rum distillery and saw spider monkeys swinging from the trees. When we arrived at the site we shared a traditional Belizean meal of stew chicken, rice and beans, potato salad, and fried plantain. We spent some time touring the museum and its amazing collection of artifacts. Mr. Wilfrido shared the history of Lamanai, the significance of the artifacts found there, and his personal experiences at the site working with archaeologists to uncover the mystery of Lamanai. After a tour of the museum, we headed to the site. Today only 5% of the 700 buildings at Lamanai have been excavated and explored. 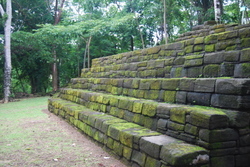 One of the most impressive temples was the High Temple that towered 35 meters above the forest floor. The view atop the temple was amazing. Also very impressive was the stucco mask of a ruler carved on the front of one of the pyramids. A few howler monkeys even watched as we explored the site. After a day walking back in time touring this sacred site of the Mayas, we boarded the boat and head back towards Orange Walk Town. 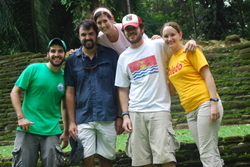 We had a great time visiting Lamanai. As Peace Corps Volunteers in Belize, we are lucky to experience such a rich history and culture right in our own backyard. “Celebrating Our Identity” is this year’s theme of the annual Maya Day sponsored by Tumul K’in Center of Learning located in Blue Creek. 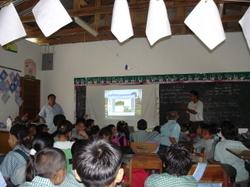 Tumul K’in is a secondary school that integrates the fundamental elements of the Maya culture into education. Last year we attended several Maya Day activities and very much enjoyed ourselves. The Maya Day celebrations began on March 16, with a torch run from Lubaantun to Blue Creek. The torch run symbolized the borrowing of the fire of passion from Maya ancestors who reignited the desire for the Maya to exist as a people. On Saturday, I attended the Harp and Marimba Competition at Central Park in Punta Gorda. The marimba looks much like the xylophone. The harp was homemade and several musicians on other instruments accompanied the harp. Several groups of musicians competed against each other. The judging was intense, and scores were tabulated using corn kernels. It was an interesting look into the traditions of the Maya, and I enjoyed myself. Other activities leading up to Maya Day on March 29, in Blue Creek, include the Maya Fireball Game, Maya Ceremonies, and the Maya Ballgame, which we attended last year. On Maya Day in Blue Creek there will be several presentations including student exhibitions, cultural exhibitions, the traditional Maya Cortes Dance, and competitions like marimba and harp dancing, best traditionally dressed, firewood splitting, corn husking, corn grinding, and caldo eating. We had a great time at last year’s Maya Day activities and celebrations, and I am sure this year will not disappoint. Located on the south side of Belize City at the end of Albert Street is St. John's Cathedral, one of our last stops we made with Aunt Roberta. St. John's Cathedral is the oldest Anglican Cathedral in Central America and one of the oldest buildings in Belize. The main structure was built between 1812 and 1820 by slaves with bricks brought over as ballast in the hulls of British ships. St. John's has regular church services, and while we were touring, the Cathedral was being set up for a wedding. It was great to see St. John's Cathedral, as it is an important part of Belizean History. We also visited the Maya Ruins of Cahal Pech in the Cayo District on the outskirts of San Ignacio during our visit with Aunt Roberta. Cahal Pech is Mopan and Yucatec Maya for “Place of Ticks,” a nickname the site earned in the 1950’s when it was surrounded by pastures grazed by tick infested cattle. 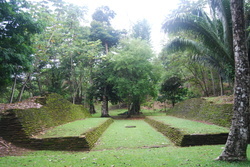 Cahal Pech is the oldest known Maya site in the Belize River Valley, was first settled between 1500 and 1000 BC, and it was a significant Maya settlement for 2000 years or more. The trail through the forest entering the site was beautiful, and the structures were pretty impressive. It was great to see such an amazing part of history. While Aunt Roberta was visiting, we drove up to the Maya Ruins of Lubaantun. Lubaantun is located near the village of San Pedro Columbia in the Toledo District, and is thought to have been occupied from around 730 AD-880 AD. Lubaantun is Maya for “Place of Fallen Stones,” and was discovered in 1903. It is the site where Anna Mitchell-Hedges found a crystal skull in the 1920’s, though there is much debate behind the true origin of the crystal skull. Lubaatun is famous for the rounded corners of its main buildings that were constructed by layering and fitting together precisely carved stone blocks with nothing to bind them, as well as the many ceramic figurines found there, many of which represent ball players. Our trip to Lubaantum was perfect. The weather was great, and we enjoyed walking around and learning more about the ancient Maya with Aunt Roberta. The Julian Cho Society made a visit to St. Benedict R.C. School earlier this week. Named after a man who led the movement of fighting for Maya land rights, the Julian Cho Society, focuses on education and outreach in the Maya communities of Belize. In recent news, the Julian Cho Society helped win a landmark case concerning the custodial land rights of local Maya Villagers. Mr. Thomas Caal and Mr. Morvin Coc gave a presentation to the Standard I and II students as a part of the Maya Area Cultural Heritage Initiative. The MACHI project is a grassroots educational program serving the Toledo District. The program focuses on maintaining and preserving the Maya culture and heritage. The presentation included a brief history of the Mayas in Belize, the cities where they lived, and the influence of the ancient Mayas on present day communities. Around 75% of the students at St. Benedict are K'ekchi Maya and Mopan Maya. It is important that they begin to understand the significance of their Maya heritage and how important it is to value their Maya culture. Belize is widely known for its rich Maya cultural heritage and many ancient Maya Ruins. 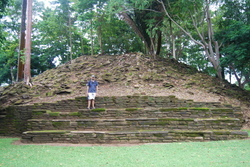 We recently made the journey to one of the smaller Maya sites, Nim Li Punit, “Big Hat” in K’ekchi. Nim Li Punit is about 26miles north of Punta Gorda off the Southern Highway near the village of Indian Creek. Discovered by oil company prospectors in 1978, Nim Li Punit dates back to the Middle Classic Period, 400-700 AD, and continues to the Post Classic Period, 800-1000 AD. It is most famous for the 26 stela, carved stone pillars commemorating important events. The longest stela depicts the ruler wearing a diadem, or big hat, after which the site got its name. The site is composed of three main areas, the West Group, South Group, and the East Group. The South Group contains the Plaza of the Royal Tombs and the Plaza of the Royal Stela. The Plaza of the Royal Tombs is believed to have been the residence and burial site of the royal family, where three tombs were uncovered. The East Group contains residential structures and over looks the ball court, and the West Group houses the largest building. We hiked up to the site, and we were greeted with a spectacular view. 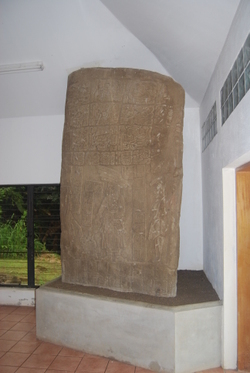 At the visitor’s center we saw the famous stela and learned all about this historical place. We toured the site, stood at the tombs, gazed at stelas, imagined what it may have been like in the ball court, and marveled at the ancient structures. We saw different species of birds, butterflies, and we even saw a wild gibnut. It was a great way to spend the morning, and we really enjoyed learning more about the ancient Mayas.